What would NYC look like in the Grand Canyon, or Death Valley? 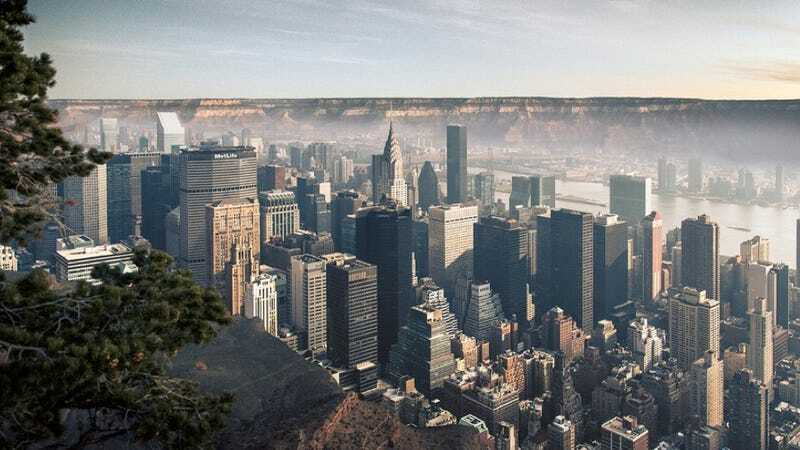 We've seen how New York City might appear were it suddenly transported to another planet, but what would, say, Manhattan look like if it were transplanted somewhere else right here on Earth – Death Valley, for instance, or the Grand Canyon? Well... it would look something like this. What if New York City was transported to another planet? You're looking at a photo from Merge, the latest installment in a three-series project by Switzerland-based artist/photographer Gus Petro. The title of Petro's third series sounds a bit enigmatic, until you learn the names of the parts one and two: Empty and Dense. "I recently travelled from Europe to USA to experience something new," Petro tells io9. "I believe I was looking for a feeling. And it was something I didn't expect: emptiness and density. The contrast between Grand Canyon and NYC was so strong and overwhelming that I had to express it somehow." The result is a jarring, if believable, mashup; Petro tells The Atlantic Cities that "after showing the images, most of the people who haven't been in either place thought it was real... They began questioning me where it is." "It seems like everyone wants to live [in New York City]," writes Petro on his website, whereas the Grand Canyon and Death valley are entirely unlivable. We asked if he'd want to live in the city depicted in his creation. His reply: "I would love to live there in any case :)"
Which might explain NYC's whole cost-of-living situation. See more examples of Petro's work – including additional images from Empty, Dense, Merge – on his website. You can also see what he's up to on Facebook, Twitter, Google+ and Behance.